If you have pure olive oil on hand, you have everything you need to treat acne. Using olive oil for acne is an old trick. It may seem a little strange to use oil on an oily face, but this treatment has proven time and time again to work on all skin types. Be sure the olive oil your using is pure extra virgin, cold pressed, organic olive oil. Read labels to make sure it has no additives of any kind so it's compatible with all skin types. Follow the instructions and watch your skin clear up. Every night, take a tablespoon of olive oil and put it in a bowl. Using very clean hands, take some with your fingers and rub your fingers against each other so you heat the oil a little. Begin rubbing the oil on your face, avoiding your eyes. Just rub the oil in a circular motion all over your face. Take a washcloth and dip it in hot water. Wring out excess water and put the hot cloth on your face for a minute. Then, begin wiping the oil away with the washcloth. You can dip the wash cloth in the water to help remove the oil. 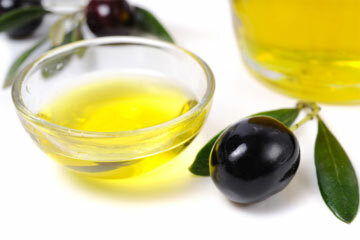 Once your skin is completely dry, dip your fingers in the remaining olive oil and rub it on your skin. This will help make sure your skin stays moisturized and isn’t dried out by the hot water. Take a tablespoon of olive oil and put it in a bowl. Measure out a tablespoon of sugar and mix it with the oil. Using very clean hands, take some of the mixture with your fingers and rub it on your face, gently exfoliating your face. Once you have finished scrubbing, take a dry wash cloth and cover your face for five minutes. Take a new wash cloth and using lukewarm water, begin removing the oil and sugar mixture. Make sure all the sugar is gone from your face before you take just a bit of olive oil and moisturize your skin. Apart from using olive oil for acne, be sure to cook with it too. Create healthy snacks and meals that use olive oil as either a cooking agent or for drizzling. You can use it in salads, on baked dishes, and some fried dishes too. Full of antioxidants, olive oil can help make sure you have a healthy system on the inside, which will help your acne too. Amazing posts! Natural products are always best to tackle various skin problems caused by pollution and chemicals found in chemical products we use for skin care. People looking for such natural products may find them at world organic. Thank you for the useful advice !!! Excellent post ! Its amazing how many different natural remedies you come across for treating acne,definitively a lot safer than some of the drugs you can use to treat the condition.